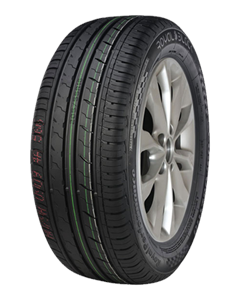 Outside-Pattern with well balanced rigidity makes pressure on contact patch spread equally, providing excellent dry surface handling. Inside-Curved groove walls are designed to aide shoulder water-directing grooves in water evacuation, providing stability and safety on wet roads at high speeds. Central part of pattern is designed to increase resistance to hydroplaning. Brand new noise-reduction design-5 differently formed blocks are placed in optimized disorder fashion to reach lowest noise level. New wide outer profile design, while turning, not only allows to spread car weight pressure on contact patch more evenly, but also expands contact patch surface, improving handling.